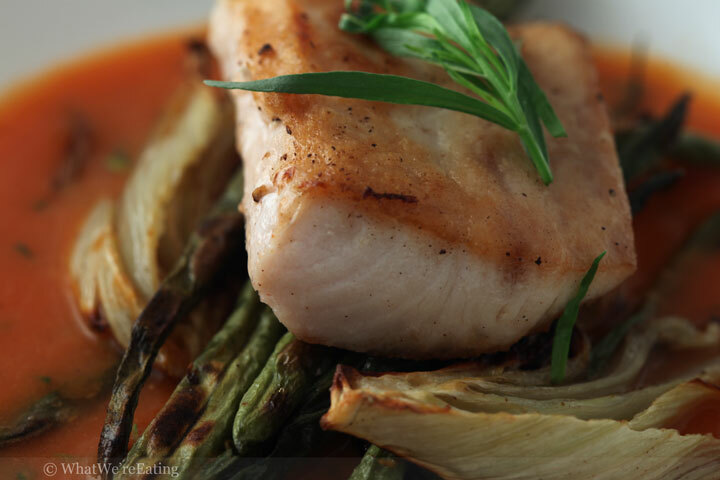 We’re eating simply seasoned mahi mahi that was seared and placed on a bed of roasted green beans and fennel sitting in a pool of slow roasted tomato and tarragon broth. Here at WWE, we love fish. No. Really. You’re not taking me seriously enough. WE FREAKING LOVE FISH. Like, the kind of love that has you growling animalistically at anyone who appears to be eyeballing your plate. Or the kind of love where the first thing you do when you get a fat paycheck is run to the fish market and see what is the freshest, nicest piece of fish you can get your grubby hands on. Yup. That pretty much explains the love of fish that both T and I share. It’s this love that most often leads me to simply seasoning whatever sea creatures I purchase with only salt and pepper then cooking them either by searing, broiling or grilling to let the flavor of the fish really shine. Now, don’t get me wrong – I’m not saying I dislike marinated, blackened, glazed or encrusted fish, but for me, if the fish is fresh I want to savor that delightful, flaky, moist poisson without being overwhelmed with other flavors. What’s that you say? My tomato-tarragon broth and my roasted fennel and green beans will overwhelm the fish? Nonsense! Note that the fish is left on top so that the diner is left to choose how each bite will enter his/her mouth. You have the option of getting all of the flavors together in one bite, or just eating the fish separately. I have to admit I did a little bit of both. Frankly, the broth was so good that T mentioned he could drink it. This is a great one to make before the tomato season ends for this year. I hope you guys enjoy it as much as we did. Preheat oven to 200 degrees. Place tomatoes in a glass or ceramic baking dish. Drizzle liberally with oil then sprinkle with chopped garlic, kosher salt and freshly cracked black pepper. Toss to coat. Situate the tomatoes so the cut fleshy-side is facing down. Place the whole thyme sprigs evenly on top/around the tomatos. Roast in preheated 200 degree oven for 6-7 hours or until the skins are wrinkled and the tomatoes are partially dehydrated. For this recipe you do not want completely dehydrated tomatoes. Allow the tomatoes to cool until they are able to be handled. Carefully remove and discard the skins by peeling them with your hands. Discard the thyme sprigs as well. Scrape the rest of the contents of the baking dish (tomatoes, juices and garlic) into a blender with the chicken stock. Puree until silky smooth. If the tomatoes were large you may need add a bit more chicken stock to achieve the desired consistency. You are looking for a slightly thick, velvety texture. Pour the contents of the blender into a small sauce pan and place over low heat. Heat the broth for about 10 minutes over low heat, stirring occasionally, until hot but not simmer. Remove from heat and add chopped tarragon. Stir. Taste and adjust seasonings as necessary with kosher salt and freshly cracked black pepper. This broth goes great with pretty much all seafood and chicken. Enjoy! Place green beans and fennel wedges on a large baking sheet. Drizzle with canola oil then toss to coat. Sprinkle with lemon zest, kosher salt and freshly cracked black pepper. Toss again to evenly distribute the seasonings. Arrange the veggies on the sheet so that they are mostly in a single layer. Place the seasoned fennel and beans into the preheated oven. Roast at 375 for 40-50 minutes, until golden and caramelized. Half way through roasting stir the green beans and flip the fennel so that the other sides can have a chance to caramelize as well. Remove from oven and serve immediately. Enjoy! Place oil in a large non-stick frying pan over high heat. Preheat until there are ripples in the oil but before it begins smoking. While the pan is preheating, liberally season all sides of the fish with kosher salt and freshly cracked black pepper. Sprinkle a very small amount of flour over the tops and bottoms of each filet, rubbing in the flour and seasoning to evenly distribute. (The addition of the flour will help form a crust on the fish and prevent the fish from sticking to the pan. Place the fish in the preheated frying pan. Sear the fish for 3-4 minutes or until a golden crust has formed and the fish releases from the pan. Flip the fish and cook for another 3 minutes until just cooked through. Remove from the pan and let the fish rest for 3-4 minutes then serve immediately. Enjoy! Hint:The flesh of the fish will stick to the pan until the moment it is ready to be flipped. If you try to flip too early the fish will stick to the pan and rip apart. Let the fish tell you when it's ready to be flipped rather than you telling it! Also, the use of high heat will allow the crust to form quicker (and thus release quicker) which is desired when cooking fish, otherwise the fish will be dried out by the time it releases itself from the pan. Seriously though, you consistently make the best damn fish. Most people overcook fish. I didn’t understand that until I had fish that you made that was completely moist and delicious. Then I realized every fish I had had before that was a touch overcooked. Weird how widespread that mistake seems to be. This looks absolutely delicious! I wish we could get fresh fish here in Arkansas. What other fish would this recipe work with? Tyler – fish can be a tricky thing to good just “right”. If you cook it just a minute or two too long it’s over done, if you don’t cook it long enough it’s raw in the center. Sadly it really is a very widespread problem – even one that some seafood restaurants have. That’s the worst, imho,. If you’re going to a place that is supposed to specialize in seafood then your fish is overcooked, it’s a total bummer. Hey Regan! You could use pretty much any fresh fish you can get your hands on and put it with the roasted fennel and green beans and the broth. I don’t know what kind of fish you can get in Arkansas but maybe a fishing trip is in order! I hope you guys are doing well and your semester isn’t driving you too crazy!